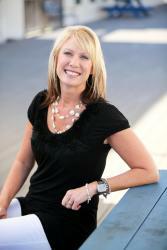 Melanie Bargar is the Director of Development at Greer Middle College Charter High School in Taylors, South Carolina. Greer’s charter school model includes offering open enrollment in college-level education courses to high school students. Additionally, in order to cultivate leadership development and instill a greater sense of community, each student is required 50 hours of service per school year while parents are required 36 hours of service. Melanie is proud of Greer’s commitment to the community connection and uses Track it Forward to track progress on the number of volunteer hours each student has completed throughout the school year. Before discovering Track it Forward, students and parents would submit paper forms. These paper forms would then have to be manually entered into an Excel spreadsheet and updated each time an individual submitted hours. The system was cumbersome and very time consuming. Melanie knew there had to be a better way and discovered Track it Forward through a simple web search. Melanie uses the data collected on Track it Forward to send out a regular e-newsletter. She can login and immediately see a snapshot of who has already reached goal and give a shout-out to the families who have completed their service hours. This is a great way of thanking families for completing their hours, while also motivating other families to get going on scheduling the rest of their volunteer service hours. Melanie loves her job, connecting her school to the community and providing parents with community service opportunities. She sees student volunteer requirements as an opportunity to promote the community and contribute to economic development. Track it Forward is an essential tool to help effectively and efficiently measure and track volunteer hours throughout the school year and has made Ms. Bargar’s job so much easier. In her free time, Melanie loves being involved in leadership development, fervently cheers on the Clemson Football and Rugby teams, and loves to volunteer at different organizations in the community.